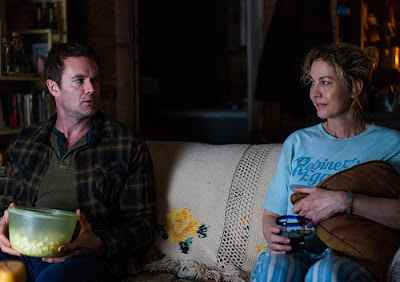 With the reveal last week that Naomi was the “Laura” person that Joe has been searching for since he was first introduced, it’s no surprise that this week on Fear The Walking Dead, we get to see “Laura” and Joe’s backstory. Told primarily in flashback form, we get to see how the two met, and why Joe is so gung-ho on finding her and getting back with her as we see a genuine post-apocalyptic love affair unfold. Not since we have watched Glen and Maggie (or “Richonne” finally hook up) fall in love have we seen the gentler side of the end of the world. The episode starts in the past as we see Joe carry out his daily activities. He lives on a secluded property. He has working electricity (or a working generator), and he lives a life of solitude. 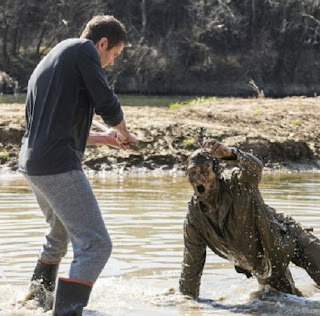 Surrounded by water, the only way zombies can get to him is if they cross the river to and cross his makeshift moat, which gives him more than enough warning to then go outside and take an ax to their heads. There’s plenty of fishes, and he grows his own crops. He’s content watching movies during “movie night” and killing zombies as they come to his home. One night, instead of a zombie showing up to his moat, it’s a person. It’s Naomi. When he rescues her, she’s delirious as she’s in extreme pain. After rescuing her, Joe sees that she’s not bitten, but instead stabbed. Naomi immediately wants to leave as she exclaims she has to go back. Joe tells her that she’s in no position to leave, which she agrees. He takes care of her, sewing her wound and making food for her. Naomi is to herself during this time and won’t even reveal her name. Joe says she “looks like a Laura,” so that’s her name going forward. Joe comes home from doing chores and sees his home ransacked and finds Naomi trying to start his car. He wants to leave as she reveals her daughter died and she just needs to get away. Joe advises her to stay with him until she fully heals, which she agrees. As time continues, Joe teaches Naomi how to live on his property. He teaches her how to fish, they go through their routines. Joe notices that the zombies are coming more and more often to his property. Turns out, there’s a crack at the bridge that is allowing them to fall into the water, where they then make their way to Joe’s property. Joe decides that they need some supplies from the local store (as the owner hasn’t been back since the apocalypse) to patch up the fence. Naomi accompanies him on their run. Afterward, they place a truck in the way to stop the zombies. Joe had the chance to kill one zombie that snuck through with his gun but ops instead to use his knife where he almost got killed. Naomi talks with him afterward about not shooting his gun and he reveals that he doesn’t want to use his guns out of him shooting a suspect when he was a cop before the world went to hell. When he shot the suspect, he was labeled a “hero” yet all he felt was the guilt over taking a life, and he swore not to use his guns again. The next night, zombies found a way through the barrier and there was a full-on horde attacking Joe’s property. They tried to fight them off to the best of their abilities, but Naomi ended up surrounded. Joe immediately broke his vow and pulled his shooters out to killed all the zombies. The next day, Naomi prepares to leave. Joe is cold and distant to her. As she confronts him, he tells her his true feelings for her and that he loves her. She walks up to him and they embrace in a passionate kiss. The next morning Joe wakes up to find out that Naomi has disappeared. Joe sees his scrabble table that the two have played on and the words “I love you too. I’m sorry” spelled out. The episode ends, revealing that Joe was telling Morgan everything about his time with Naomi. He reveals that he holds onto the scrabble pieces. Morgan affirms him that she still loves him, which gives him hope to continue looking for her.